Researchers have discovered the world's only known living population of Sibree's Dwarf Lemur, a rare lemur known only in eastern Madagascar. The discovery of approximately a thousand of these lemurs was made by Mitchell Irwin, a Research Associate at McGill University, and colleagues from the German Primate Centre in Göttingen Germany; the University of Antananarivo in Madagascar; and the University of Massachusetts. The species was first discovered in Madagascar in 1896, but this tiny, nocturnal dwarf lemur was never studied throughout the 20th century. Following the destruction of its only known rainforest habitat, scientists had no idea whether the species still existed in the wild - or even whether it was a distinct species. The study will be published in the current issue of the journal Molecular Phylogenetics and Evolution. Irwin first observed dwarf lemurs at Tsinjoarivo, Madagascar, in 2001, shortly after setting up a long-term rainforest research site. "Even then we knew something was unusual about them," Irwin said. "Instead of the rainforest species we expected to see, our lemur resembled the species known from dry western forests, only it was much larger." 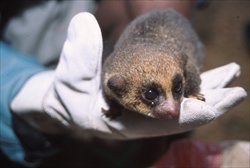 In 2006, Irwin began collaborating with Marina Blanco, University of Massachusetts at Amherst who trapped dwarf lemurs at several sites throughout Tsinjoarivo. This work led to the further surprise that two morphologically distinct dwarf lemur species were present, living side-by-side. Further work by geneticist Linn Groeneveld, German Primate Center confirmed the existence of the more common Crossley's dwarf lemur, and the elusive Sibree's dwarf lemur. The new study showed the mystery lemurs to be very similar to the only known specimen of Sibree's dwarf lemur, now in The Natural History Museum in London, England. Genetic analysis shows the mystery lemurs to be highly distinct from all other known species. In fact, the genetic analyses confirmed that of the four known dwarf lemur species, this is the most genetically unique and probably closely resembles the ancestor that gave rise to the other species. Irwin is hopeful that this new discovery will lead to increased conservation efforts. "On one hand, you want to get the taxonomy right, just to determine how many dwarf lemur species are out there," said Irwin. But protecting this newly rediscovered species from extinction in a country ravaged by habitat destruction is the next challenge. "Without the recognition provided by this study, this species probably would have gone extinct in the near future. Protecting its only known population and determining how many individuals are left are now top priorities, especially since much of this region's forests have already disappeared."